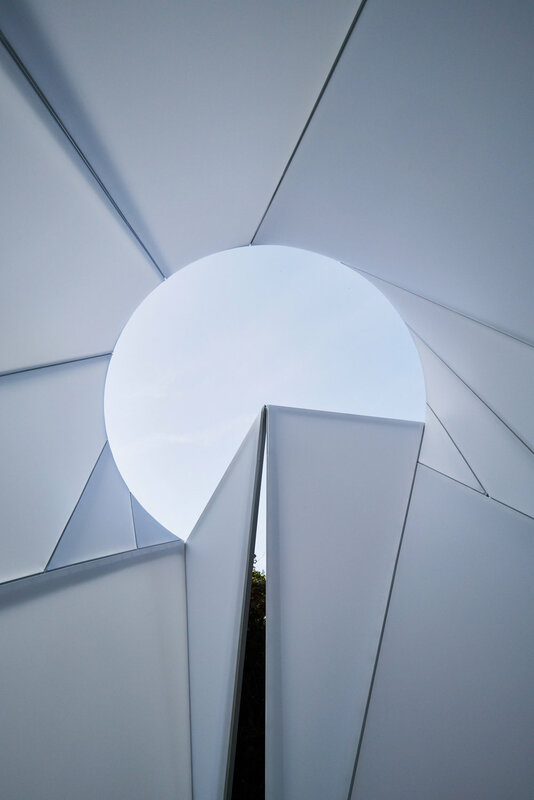 Interaural Contour I is an intimate architectural installation by artist Marianne Jõgi, an acoustically active environment, whose mathematical structure promotes relaxation, wellbeing, and supports learning. Substantiated by neuroscientific research and drawing from Jõgi’s background in music theory, sculpture and engineering, the event offers a particular sensorial experience. Interaural Contour I is accompanied by composer Ülo Krigul’s sound work Water Itself, which bridges meditational practice and concert music. Pointing to the connectivity between our inner vibrations and those in outer space, the project invites us to consider the reciprocity between the psychological and physical, the personal and environmental, as ultimately sustaining our healthful, earthly dwelling. We invited participants to join us on the Pump House Pitch at Battersea Park, to engage in a quiet, contemplative moment in the open air. This was an opportunity to experience Interaural Contour I (capacity 1-2 people), the structure of which references that of a chum or lavvu, a temporary dwelling and shelter. An inner state of calm is evoked by the installation’s mathematical construction, in which the platonic year of the Earth (26,000 years) and the alpha rhythm in the human cerebral structure (8 – 13 Hz) converge. Alpha waves are brain waves detected during wakeful relaxation. Upon entering the installation, the participants' gaze is drawn upward towards the open crown of the structure. On a clear summer’s night, this reveals a view of the apparent trajectory of the star Vega, while the centre of the arch is fixed at Polaris. The radius of the arch depicts a cyclical movement occurring between the two stars – a motion unfathomable to the human senses. 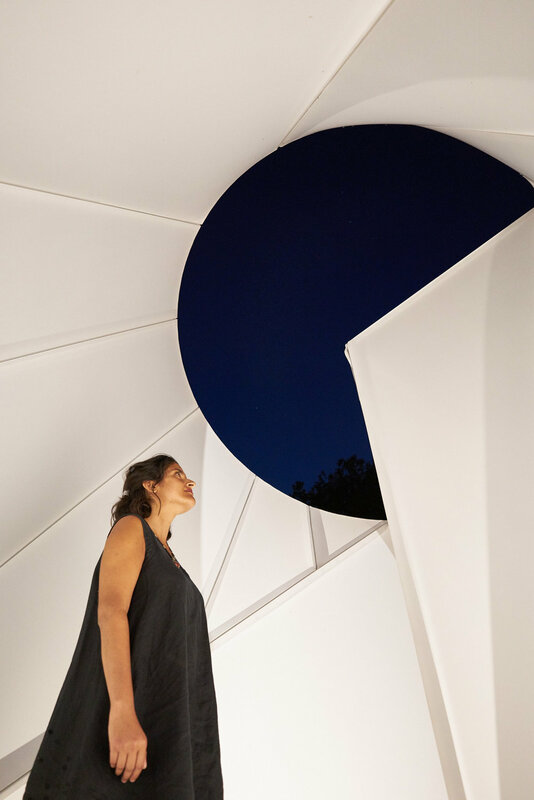 Sheltered by the installation’s acoustically sensitive membrane, one is invited to question the idea of permanence endued on the stellar sky, especially Polaris as a seemingly stable point of orientation, and perhaps also that of our earthly home. In proximity to the installation, Krigul’s sound work Water Itself (2015) was available on headphones. The 25-minute meditational piece, which narrates the meeting of water and earth, is composed in relation to the frequencies of the platonic year of the Earth (172.06 Hz), the Earth year (136 Hz) and Earth day (194,71 Hz) (approximately equivalent to the musical pitches F, G and C# respectively), thus entering into relationship with the geometry of Interaural Contour I. The sound piece was initially created as a recorded improvisation using three large tuned gongs and later transcribed for a mixed choir. The lyrics, derived from the work of surrealist poet Ilmar Laaban, are a linguistic-surrealistic play of decomposing and recomposing words and syllables, leading one to the dreamlike path of water becoming earth and water again. The music was originally presented by the Estonian Philharmonic Chamber Choir and conducted by Kaspars Putninś. Presented by curator Hanna Laura Kaljo and Estonian Contemporary Art Development Center. Supported by the Government Office of Estonia, the Cultural Endowment of Estonia, the Ministry of Culture, and Outset Estonia as part of the Republic of Estonia Centenary celebrations. With thanks to Marianne Jõgi and Ülo Krigul for your profound and exquisite artworks; Karin Laansoo at the Estonian Contemporary Art Development Center for initiating the project and inviting me to be a part, Kadri Laas and Kadi-Ell Tähiste for meticulous project support and emotional involvement; Zarina Rossheart from Art Night for tireless correspondence; Tara Rai for your calm presence and communication; Nick Robinson and Andrew Ronald for your warm-hearted support; Sten Jõgi and Lenari Lanno at Laestuudio, Michael Heilgemeir at Original&theCopy, Simon from Silent Event, Ned McConnell and Lou Marcellin at Pump House Gallery, Cara Gibson at Battersea Park and Paul Meadows at Salus. All images by Michael Heilgemeir, courtesy the artists and ECADC, Tallinn.